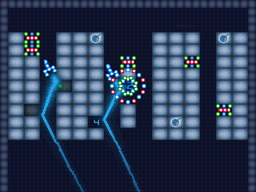 Take out the enemies on each stage with the missiles provided in a set number of turns. Use the stylus to point the missiles and then fire. Missiles will reflect off walls and destroy blocks in your path. As you progress, you also unlock Drill Missiles and Bomb Missiles which allow you to create paths. Hit the 2x Blocks to double the number of missiles you can fire in a turn. Clear stages with at least one turn remaining to earn medals.